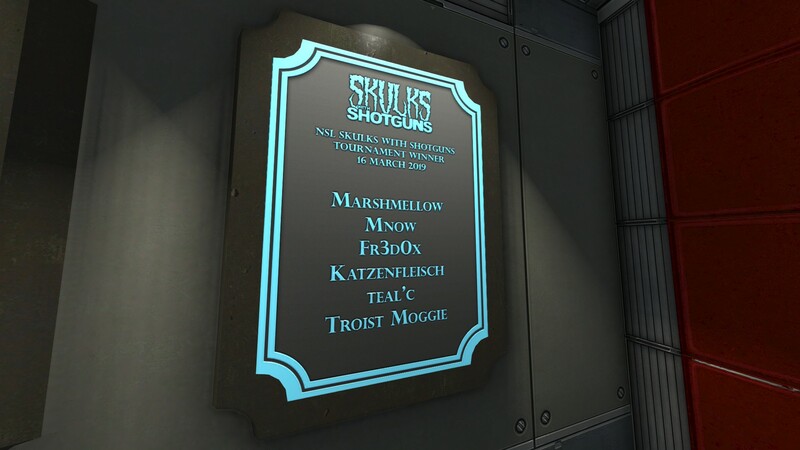 Congratulations to Marshmellow's team: Mnow, Fr3d0x, Katzenfleisch, teal'c and Troist Moggie. And congratulations to all players who joined and played the tournament, we hope you enjoyed it despite the issues. We will ensure everything works perfectly next time. If you have any feedback regarding the mod itself or how the tournament ran, feel free to share it. Many thanks to Jackson for casting the tournament! If you missed it, you can watch the replay here. Lots of thanks Flaterectomy for making the plaques! They’re now viewable in the Ready Rooms of the maps sws_gorgasm and sws_refinery. They will hopefully soon be displayed in the sws_edenfixed2 Ready Room. Flaterectomy also took the time to texture and improve the whole Gorgasm Ready Room. You can find some pictures of his amazing work here! Signups are now open. Click here to sign up! Date: to be decided in the Signups by you guys. The format will be decided based on signups. Our goal is to make sure each team has the most playtime and that we will come close to a 3-4 hour event. Starting Sunday March 24th, we will be scheduling gathers all day and every Sunday. Make sure you show up at 11:30am EST and 17:30 CET on Sunday because gathers will be FILLING UP FAST. !gp to add/remove yourself from the group @Gather Players. !gather to advertise Gathers to all people within the group. Season 15 is still on hold. If at least 8 teams sign up for the contest, we will run a short season that will last approximately 5 or 6 weeks.